Roderick Eime reminisces on Honda’s history on the occasion of their fortieth anniversary in Australia. Forty years ago, a humble man in a big suit stepped onto the surface of the moon and uttered those famous words. On a different scale perhaps, but when Hidehiko Shiomi set up shop in a Melbourne flat, his mission was also the first step in a momentous journey. Shiomi planted the flag for Honda in Australia and launched one of the most successful international car brands to reach our shores. But like so many of the fledgling Japanese manufacturers, their initial prowess was not with automobiles. With Japanese industry clawing its way out of the rubble of World War II, manufacturing was based on necessity and cheap, easily assembled items were in demand. Honda’s visionary founder, Soichiro Honda, who gave the company its name, began by attaching tiny two-stroke motors to bicycles and by 1948 was building complete units. By 1963, Honda was the world’s largest producer of motorcycles, even outselling the likes of Triumph and Harley Davidson in their home markets. Soichiro Honda was a dreamer and “dreams” have been a guiding light throughout the company’s history. Before the war, Honda was a tinkerer and worked with a tuning shop, Art Shokai, on performance and racing cars. 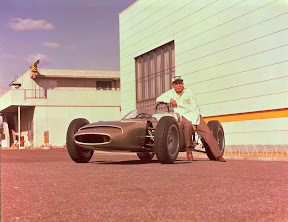 In 1963, Honda’s team of engineers and trusted friends like Tadashi Kume produced the first all-Japanese Formula One car powered by a 1500cc V12 engine mounted transversely into the aluminium RA271 chassis. In 1965, the little racing car beat Brabham, Lotus and Ferrari in the Mexican Grand Prix to record their first win. Although Honda have withdrawn (temporarily, we hope) from F1, their sophisticated and reliable engines have held unassailable status in the sport when teamed with manufacturers like McLaren and Williams during the ‘80s and early ‘90s. Ayrton Senna, Nelson Piquet and Alain Prost all won championships when propelled by Honda engines. Racing and performance engineering have served Honda well and many lessons learned from the rigours of competition have found their way into their advanced road cars. Such developments as computer engine management and traction control are just part of a long list of enhancements spawned from racetrack research. But like so many vehicles on our roads in the 1960s, their technical and aesthetic qualities were far removed from what we take for granted today. Honda’s first retail offerings in Australia bore such names as Life, Scamp and Z360, cars manufactured to comply with a curious tax requirement in Japan that encouraged the fitment of motorcycle-sized engines. These tiny runabouts set the scene for Honda Australia as an importer of small and eminently practical vehicles. In 1972, the Civic was introduced and over the next 37 years has risen to become one of the world’s most famous production cars alongside Model T, VW Beetle, Mini and Citroen 2CV. Almost 20 million units have been sold in 160 world markets. As a global company, Honda produces everything from portable generators and lawnmowers to experimental robots and aircraft, but it is their technical prowess and exacting engineering standards that set them apart. Honda Australia now offers seven distinct vehicles in Australia ranging from the new entry-level model, Jazz, through City, Civic, Accord, Odyssey and AWD CR-V to premium Legend. The upper-mid saloon, Accord Euro, is the current Wheels Magazine Car of the Year. If ever there was an endorsement for “The Power of Dreams” then Honda is living proof.